In between spa facials, I treat myself to masks once a week. I like to mix it up a bit, focusing on whatever I feel my skin needs at that moment—hydration, firming, etc. Here are a few I’ve tried over the past few months that you might like. Zensation is a skincare line from Switzerland that combines Swiss Alpine botanical extracts, biotechnology complex and neuro-stimulating molecules to create gentle products with great results. Their Brightening Mask helps even skin tone and lighten unwanted pigments. Seabuckthorn extract, high in vitamin C, is a great “free radical scavenger,” as its website notes. Mulberry, watercress and strawberry begonia extracts are other key ingredients. With a lovely light scent, this mask lives up to its promise. I loved the way it’s packaged, too, in a pretty jar inside its own gift box. $100 for 1.7 ounces. Eudoran International’s Reactivator line includes the EGF Control Mask that is also pretty awesome. EGF, or Epidermal Growth Factor, is a low-molecular-weight polypeptide that plays an important role in cell regeneration. It is designed to deliver ingredients such as aloe vera and hyaluronic acid, which helps in tissue repair. The Control Mask brightens, firms and moisturizes, and comes on a soft cloth sealed in a packet. Open and unfolded, it is an actual mask with holes for your eyes, nose and mouth that you apply to your face. There are four treatments to a box, which costs $25. By Nieves Handmade Natural Body Care’s Face Fix mask doubles as a scrub. It comes in an old-time-looking bottle in powder form, which enables them to leave out emulsifiers, surfactants and preservatives that can irritate sensitive skin. It’s packed with beneficial herbs such as white willow powder, which has naturally occurring salicilic acid, and rosehips, which are high in vitamin C and other antioxidants (I’m a big fan of C for the skin). Horsetail powder has silica, and licorice helps calm eczema and redness. I’m not normally a fan of powder products. Sue me, I’m lazy. But this product is well worth the extra time and trouble it takes to mix up a batch. $32 for a four-ounce jar. Koh Gen Do began as a small salon in Tokyo back in the 1980s and has grown to an international cosmetic and skincare company. 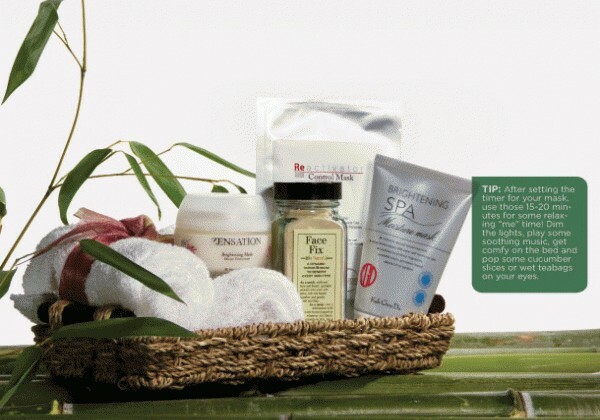 Their Brightening Spa Mask includes Moroccan lava clay, which is powerful in removing pore-clogging impurities. Rich in minerals, it also includes artichoke, rosemary and sage leaf extracts that heal, reduce inflammation and redness, moisturize, balance sebum production, and prevent free radical damage. 3.53 ounces go for $67.